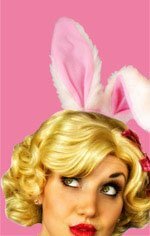 Everyone loves the Easter Bunny & Capone’s Dinner & Show has their own “Bunny-June” to get your Easter Sunday hoppin.’ Our zany cast of characters will make this Easter Sunday an evening to remember! Celebrate Easter Sunday at Capone's Dinner & Show on Sunday, April 21, 2019 at 7:30 p.m., and your gang will receive a free gift! 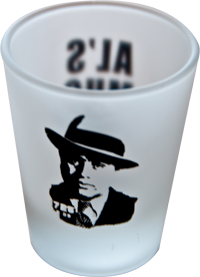 Each paying adult guest receives a free Capone's shot glass, and each paid child ticket receives a fun* fedora hat! per adult and $22.99 per child (ages 4-12) using our COUPON valid on Easter. “Easter $34.99 Special” if you are calling in your reservation. You may also present the coupon at the box office on April 21, 2019. Since 1992 we’ve entertained guests with our one-of-a-kind prohibition era speakeasy. We hope you will enjoy the video (link below) and will spend some time browsing our WEB SITE where you'll find our MENU, SPECIALS, more information about our SHOW, guest COMMENTS, REVIEWS and much, much more. Enjoy Capone's Dinner & Show this Easter Sunday, you'll be glad you did! 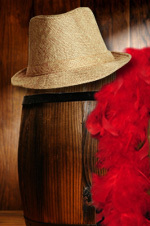 Buy your gang a feathered boa or a classy fedora to wear during your visit!